I can write in English for you. I was afraid of that, very sorry! I would like to learn Japanese someday, but it's difficult for me right now. The errors in the images are as shown. The Laser Dress sprite does not appear, and I have to delete SavedBarrageData.dat whenever I run the program. When I use Japanese locale (whether it's AppLocale or system setting), whenever the program runs, it creates the correct "四聖龍神録2" folder and puts save data there, but it also creates an empty folder with a gibberish name, which is probably just "四聖龍神録2" in the wrong encoding. When I use English locale, I only get the gibberish folder, and save data is put there. The config program doesn't save. I can edit Config.dat successfully, though I don't know the commands for the GROUP_WINDOW_MODE setting. These errors all occur in previous 0.9x versions, as well as version 1.00. If any of the errors have to do with Windows 7, I don't know what to do. If it helps, 四聖龍神録1 currently does not have any of these problems for me. 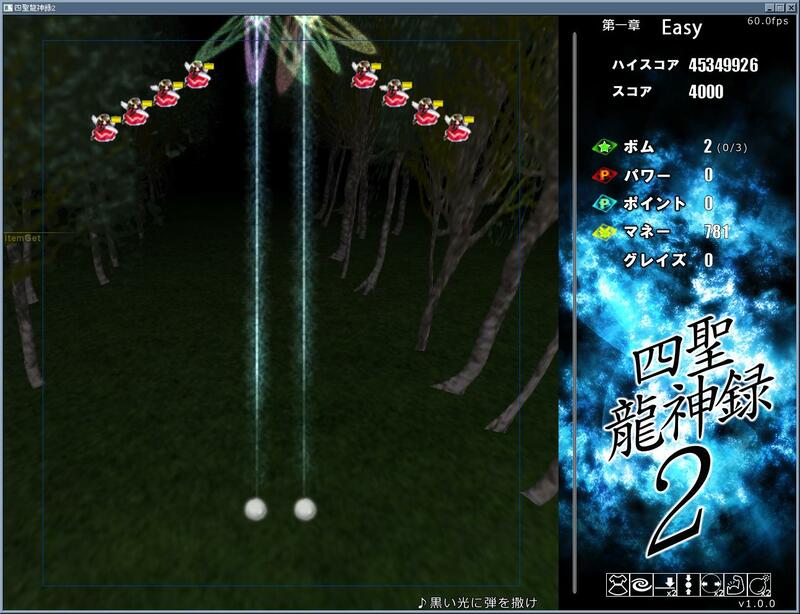 I was also wondering if you would ever work on 四聖龍神録1 again. Thank you for these games! I've enjoyed them a lot, and I'm looking forward to 四聖龍神録2 Plus. Sorry, I didn't see the second part of your message! I'm from the United States (アメリカ). Thank you for your reports. V1.00 included the Bug that the Laser Dress sprite does not appear. I fixed the bug, and released as ver1.01. I apologize about problems of the character encoding. Since many Japanese characters are used in many program codes, problems can not be easily solved. I will fix the problems of Japanese Character at a later date. Please wait while few days. And, someday, I want to create complete English version that is translated. Dixq, thank you for this update! A full translation would be a great outcome! I might be able to help, but it's not a guarantee... please give me a few days? I guess the problems with saving files are related to the character problems. I didn't suppose that non-Japanese play this game. I use Japanese character in file path. I should not use it. I want to unify English character, but I must to convert the data of players that is already playing in Japan. > I might be able to help, but it's not a guarantee... please give me a few days? Thank you. I'm glad to hear that. Yes, I wait a few days. The v1.01 update stopped the gibberish folder from being created when I run the game, but it does get created if I run 設定.exe. I still get the SavedBarrageDat problem no matter what happens. Strangely, the corrupted folder is still created, even when I use Japanese locale. 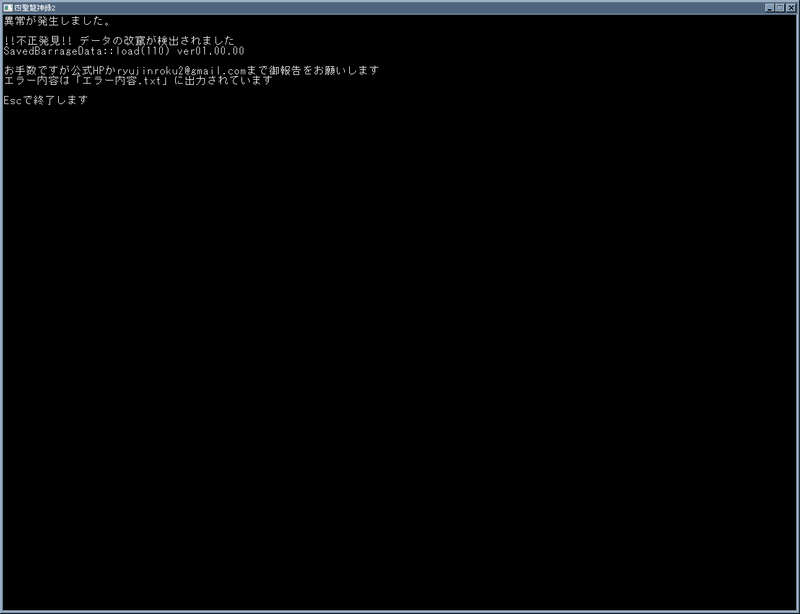 This also causes 設定.exe to not work properly, but editing Config.dat is easy.